Imagine an LED-fitted moving yoke that can fit in the palm of your hand. MiN™ Wash RGBW has a powerful 13-watt quad-color LED and 5- or 13-channels of DMX control. It has built-in sound activated and automatic programs and vector speed channel for smooth pan and tilt and RGBW color mixing—from soft pastels to vivid, saturated colors. It’s a surprisingly bright compact fixture, weighing less than nine pounds, and perfect for small clubs or mobile DJs. 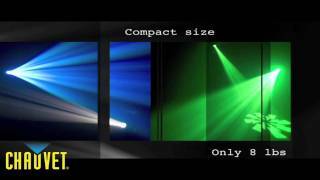 Considering purchasing the Chauvet Min Wash RGBW LED Moving Head? Have questions? Ask people who've recently bought one. Do you own the Chauvet Min Wash RGBW LED Moving Head? Why not write a review based on your experience with it. 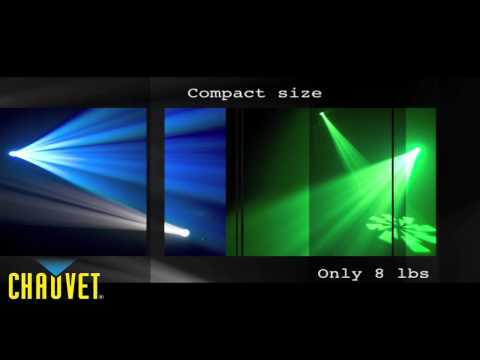 Seen a video for Chauvet Min Wash RGBW LED Moving Head online or have you own video? Check out Chauvet Min Wash RGBW LED Moving Head on DJkit.com!